I have an announcement to make and it’s not one that I’ve made lightly or without a tremendous amount of thought, conversation, and reflection: After two years, the MusicPLN.org will officially close its doors on May 1st, 2012. 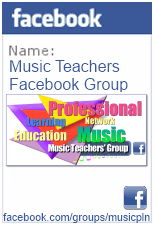 In its place a number of us have begun and, with this post, officially announce the Music Teachers Facebook Group. You can find it directly with this URL: http://facebook.com/groups/musicpln or http://mustech.net/go/musicteachers. I’ve already been asked about why I’m closing the MusicPLN.org and feel that I most certainly owe an explanation in some modicum of detail. There are a number of financial obligations that were being well-met with the MusicPLN.org through various means, the MusicPLN.org required a fairly heavy and custom server and a hefty monthly payment, but that was not a consideration in this decision. The time factor of keeping the site together was a huge obligation for me and a small part of the reason for the change. As you can imagine, there was a lot of programming that went into the MusicPLN.org as it was using open-source code that was fairly “buggy”. I was spending three times as much time fixing issues with the site as I was participating with the conversations happening on it. Any time I wanted to do something new, it required hours-on-end of programming and even more trouble-shooting -not to mention the battler with ever-smarter “spambots”. However, this was still only a small factor with regard to my decision to migrate to a Facebook group -but nonetheless, still part of the decision. I’ve been a member of Facebook since 2007. I’ve always kept my presence of Facebook professional and rarely use it as the typical Facebook user does (leisure and life events). Sometime during the last year, I noticed some significant changes to the “pages” and “groups” on Facebook. Changes that made me begin to think about the viability of using Facebook as a group to carry on my on-going “mission” to expand our music education conversation to include the majority of music teachers everywhere. While Facebook does not offer near the functionality that the MusicPLN.org was providing, it was certainly is getting closer to the “mark” with the past few updates. The shear amount of people online using Facebook is the “clincher” for me. In the U. S., there are 155,000,00 people on Facebook (http://www.socialbakers.com/facebook-statistics/). Facebook usage statistics vary from site to site and year to year, but it is not uncommon to see statistics such as: “over 50% of the Facebook users check there account at least twice per day” and that “over 40% of adults check in with Facebook first thing in the morning”. Verification for came to me, with regard to the social-reach of Facebook Groups, by observing a number of thriving, niche, social-communities within the larger community that is Facebook. I’ve been watching one group in particular for some time on Facebook: the “Band Directors” group (http://facebook.com/groups/banddirectors). This group has a staggering amount of participation from its 9000+ members. I would love to see that kind of participation replicated in the new Facebook Music Teachers Group -not only do I think its possible, I believe it will happen. I believe, now more than ever, that we need to leverage the larger social-verses (my word) as organizations and conduits for our communication needs and purposes. The largest and most useful of them are what I refer to as “the BIG four”: Facebook, Google Plus, LinkedIN, and Twitter. As these social media companies provide more effective tools for us, they become more useful and the need to create niche environments (groups) outside of them lessens with each advance. Not only this, Facebook is currently “mobile-ready” providing even more convenient ways to connect, learn, and collaborate. How many more sites do we really to need to “check-in” with? No, I don’t look for the new Music Teachers Group of Facebook to replace our longstanding use of Twitter or start-up initiatives on G+, I look at is another connection and solid-platform (with way less maintenance) for us to have that will make our conversations more meaningful and plentiful. We don’t need to “take sides” with the various social medias, but rather provide effective opportunities for those using them, whatever they might be. In the end this is a little bitter-sweet for me, as I and a number of others have put a large amount of time into the MusicPLN.org (especially at the very beginning of this all), but again, I look at all of this as an evolution of our continuing conversation and connections through social media… I do realize that there will be people that do not use Facebook. For those folks, I encourage you to look at our social outreaches on Twitter, Google Plus, and LinkedIn. Additionally, a number of the larger Music Organizations have their own community sites such as NAfME and TI:ME. These statistics are quite enlightening indeed and not-bad-at-all for a standalone entity such as our “rag tag” start-up group! These groups are outstanding examples of industry partners and organizations that truly care about the success and true purpose of Music Education. I plan on leaving the MusicPLN.org in its current state until May 1, 2012 at which time it will be taken offline and replaced with static information pointing to the new Facebook Group and our related Twitter resources. I will also be migrating some of the static page information and resources contained within the MusicPLN.org over to the the DOCS section of the Facebook group in the coming weeks. There are a number of other things that I would like to do in the coming months to mediate some of the loss of functionality associated with this move and I’ll be posting about them here, on Twitter, and on Facebook – stay tuned! I apologize for any inconvenience that this may have caused, but also humbly ask you to help us take flight with our new Facebook initiative and join our conversation in our newly formed fledgling group there. I would like nothing more than to see our membership number double that of the MusicPLN.org (goal 5000!) in the coming year and see hundreds of music educators begin a serious and on-going conversation about our profession within the group!